"Hobbies cost money but interests are free" — George Carlin. With passion, determination and a reasonable business plan, any idea can turn into a wonderful project. The same principle applies when setting up a website. A cunning administrator knows that the initial costs of launching it will be split into two categories: recurrent and one-time. Recurrent charges usually refer to hosting subscriptions, SSL certificates (which have various billing cycles, depending on the webmaster's needs), license renewals, security and monitoring services, etc. The one-time expenditures are the ones which will have the most impact in the preliminary stages: hiring a graphic designer for the site's logos, hiring a developer to properly configure Joomla!, along with the 3rd party components, etc. Of course, some of these items can easily be crossed off the list if the person in charge knows a bit of programming and design, however it is recommended to seek the help of professional freelancers or developer houses, in order to have a brilliant site. In any business plan, one must pay extra attention to the balance between revenue streams (company/organisation's money sources) and its milestones (checkpoints that determine the growth of the business). Even though the numbers may not add up from the beginning and the expenses may exceed the earnings, this fact must not lead to distress. A journey of 1000 miles begins with a single step, the same way a newly founded website will not make money from day 1. According to this hosting review site, the top providers for J! hosting are SiteGround and Host Gator, which have appealing deals, depending on the desired configuration. Normally, the more resources, the higher the cost, however for a brand new auction site, it is recommended to start off with a smaller subscription (for example suitable for 5K-10K visitors per month), then gradually upgrade it if website becomes more popular. For self managed J! hostings (in house physical servers), the main advantage is that there is no need to pay for a monthly subscription to have your website stored into a box on the other side of the world, but there are also a few tips to follow: it is generally recommended to have an open source HTTP server running and the solution chosen by over 60% of the Internet is Apache. Other alternatives are NGINX or lighttpd. In regards to the site's body, the majority of programmers around the world work comfortably with PHP and use the MySQL open source database for stability and fast configuration. In regards to the domain name, it usually needs to be as self-explanatory as possible (auctionhouse[DOT]net, biddingandbets[DOT]com, etc.) and the most mainstream places to purchase them are GoDaddy, Namecheap or Hostgator Domains. It is also important to note that the TLD industry has grown substantially over the past few years and now there are a lot more options to pick from than the standard country ones (.co.uk, .pl, .es, .nl, etc.) or generic ones (.gov, .edu, .org., .net, etc.). 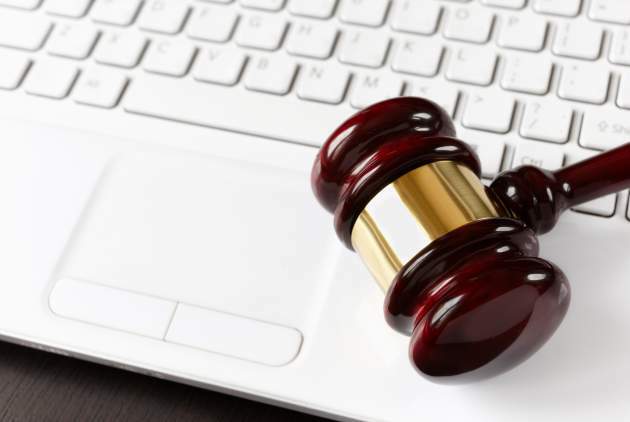 For an auction website, if it is not necessary for the TLD to reflect the country of origin, admins can choose either .agency, .bid...or simply explore the recent TLD additions! As we have mentioned in the first part of the tutorial, there are several types of auction sites that can be created on the Joomla! CMS. For a first time venture, it is always recommended to opt for the classic auction model, as it is the easiest to understand and configure. Auction Factory has been designed with the classic English auctions in mind, offering a wide range of monetizing possibilities. Due to its versatility, it can very well serve both as a bidding platform and as a way of connecting people who share the same interests. It has been listed on JED on 2009 and since then it has gained the users' trust and respect. It is one of the best auction extensions on the market and given the success it has registered, it has been followed by other auction extensions, equally popular. The beauty of J! 3.x series is that you need 3 clicks to manually install it. Most Joomla! hosting solutions have the option to perform the installation through their CPanel, which is equally simple and fast. We always recommend choosing extensions from the official directory, mainly for security reasons, as they have been thoroughly verified and tested. 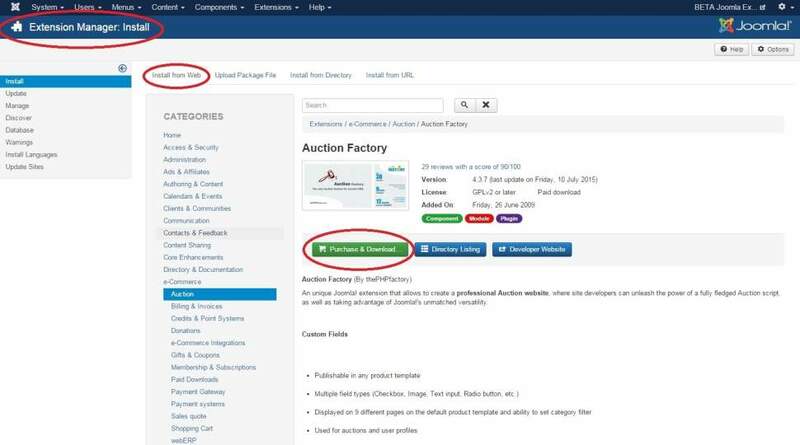 For example, Auction Factory can be easily downloaded from its listing page, or by simply accessing the Extension Manager category from the Joomla! backend, then using the Install from Web tab to search for the desired component and proceeding with the Purchase and Download action. Just a few more configuration tips and tricks to go and managing an auction website will be easy as pie!